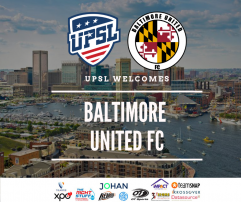 LOS ANGELES - Dec. 12, 2018 - PRLog -- The United Premier Soccer League (UPSL) is pleased to announce Baltimore United FC as a member starting with the 2019 Spring Season. Based in Maryland's largest city, Baltimore United FC will begin UPSL play in the Northeast Conference and play its UPSL home games this season at Latrobe Park (1627 E. Fort Ave., Baltimore, MD 21230) in compliance with UPSL's Minimum Standards. United Premier Soccer League East Coast Director Jim Antonakas said, "It's exciting to welcome Baltimore United FC to the Northeast Conference for the 2019 Spring Season. The owner has put together a strong brand with strong values, and the club has been competitive in the Maryland Majors Soccer League. Isaiah Anyaogu has an exciting vision, and we look forward to having Baltimore United FC take the field in an increasingly competitive division next season." Baltimore United FC is owned by Isaiah Anyaogu, a former professional soccer player. The owner of Baltimore (Md. 's) Izee Auto Body, Anyaogu created Izee Auto FC in 2015 and was a 2016 Fall Season finalist and the 2017 Spring Season champion in Maryland Majors Soccer League (USASA). The club also advanced to the Second Round of the 2017 Lamar Hunt U.S. Open Cup. Baltimore United FC Isaiah Anyaogu said, "We want to start with Baltimore United FC because it's going to be a much stronger team. We have a lot of young, talented players and we're going to mix in some with Izee Auto FC, which has more players that are former professionals. The guys on the Baltimore United FC team are young and they're hungry, and we're excited to get started in the UPSL." Izee Auto FC also was a finalist in two Maryland Amateur State Cups in 2018 – the Rowland Cup and the Stewart Cup – and will continue to operate in Maryland Majors Soccer League. Christian Castillo is the Head Coach of Baltimore United FC. A native of Bolivia, Castillo, 30, is a former D.C. United Youth Academy player before going on to a professional career abroad. He concurrently serves as a regional scout for D.C. United (MLS). Baltimore United FC Head Coach Christian Castillo said, "One of my goals once I retired from professional soccer was to help players from the area I grew up to have an opportunity to responsibly and correctly chase their dreams of being a professional athlete. I didn't expect it would happen so soon, but after a career-ending injury at the height of my career I pushed fully to take the next steps as a coach and I feel that I'm prepared for the project we are starting. Sharing the same vision and values with Isaiah and my coaching staff, we are excited to take Baltimore United FC to the next level. We're looking at trying to play at the highest level we can, and the UPSL is growing with strong clubs because of its full-rear schedule. We don't want to be a summer stop for college players and we don't want to be an amateur team. We want to be a professional club and that's how we're going to conduct ourselves." Castillo played professionally in Bolivia, Brazil, Canada and Puerto Rico for more than five years, and participated in many domestic and international cups. In the United States, Castillo played for D.C. United Youth Academy (U-16s through U-20s), Marietta (Ga.)'s Southern Poly State University, London (Ont. )'s FC London and the Des Moines (Iowa) Menace (PDL). He previously served as an Assistant Coach for D.C. United's Under-23 Team and as an Assistant Coach for the Bolivian National U-17s, U-20s and Men's teams. Baltimore United FC will announce its upcoming tryouts dates and game schedule. Baltimore United FC is an American Soccer club currently based in Baltimore, Md., and a new member of the United Premier Soccer League. Baltimore United FC will begin play in the UPSL Northeast Conference. Founded in 2018, Baltimore United FC can participate in the qualifying rounds for the Lamar Hunt U.S. Open Cup through their affiliation and membership with the UPSL, the U.S. Soccer Federation (USSF) and the United States Adult Soccer Association (USASA).